This page offers code and data sets for download. The respective tools were developed in master theses under my (co-)supervision and the corresponding thesis can also be downloaded here. The zip-file contains a list of functions useful to derive wind power production from MERRA-2 wind speeds. In particular, we provide an extensive list of functions for vertical and horizontal interpolation of wind speeds, and for bias correction. The respective background is described in two master theses (by Sebastian Mooshammer and Johann Baumgartner, who also wrote the code), listed below. 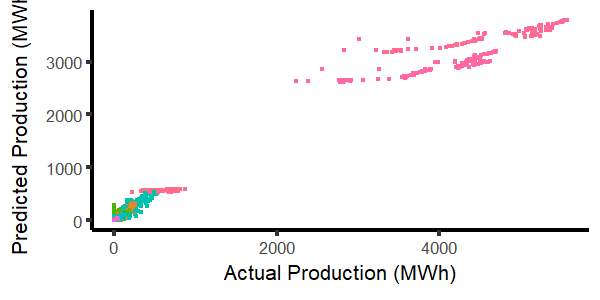 There is an example script included for a wind farm in New Zealand, including real production data (for validation and bias correction) and the necessary MERRA-2 files. Sebastian Mosshammer: Validation of MERRA-data with a wind power simulation model in comparison to real production quantities. 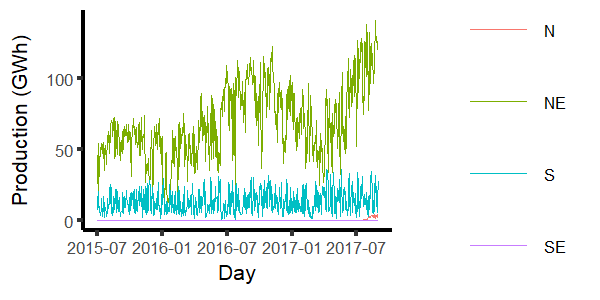 Johann Baumgartner: Modelling the aggregated wind power generation of windparks in comparison to measured output for two case studies in Austria and New Zealand (in German). Sebastian Gatscha has developed a genetic algorithm to optimize the placement of wind turbines within a wind-farm, considering wake effects. He published the R-code on Github. He additionally developed a Shiny-App which can be accessed here. Sebastian Gatscha: Generic Optimization of a Wind Farm Layout using a Genetic Algorithm.